The Syrian Air Force has received a batch of Su-24M2 (NATO reporting name: Fencer-D) frontline bombers supplied by Russia, according to the AMN news agency. "The Syrian Air Force has received several Su-24M2 aircraft supplied by Russia in order to beef up the Damascus` combat capabilities to fight against international terrorism. At present, two Su-24M2 aircraft have been delivered with eight more planes to be transferred in the nearest future," the news agency said. According to AMN, Russia has supplied the aforementioned Su-24M2 frontline bombers to the Syrian governmental forces within the framework of the military-technical cooperation between Moscow in Damascus. Su-24M2 is the latest development of Su-24M frontline bomber developed in the 1970s. The upgraded aircraft made its maiden flight in 2001. It has a length of 24.59 m, a maximum wingspan of 17.64 m, a height of 6.19 m, a normal take-off weight (NTOW) of 33,500 kg, a maximum take-off weight (MTOW) of 39,700 kg, a payload of 8,000 kg, a maximum speed of 1,700 km/h, a combat range of 560 km, and a service ceiling of 11,000 m. Su-24M2 has received advanced multifunctional displays (MFD), GPS/GLONASS/IN (inertial) combined navigational system, new data display devices, and upgraded communications suite. The enhanced software of Su-24M2 allows firing Kh-31A (AS-17 Krypton) anti-ship and Kh-31P (AS-17 Krypton) anti-radiation missiles, as well as KAB-500Kr guided bombs. Su-24M2 can be equipped with electronic warfare (EW) systems. According to the Military Balance 2016 report issued by the International Institute for Strategic Studies (IISS), Russia`s Aerospace Forces (Russian acronym: VKS, Vozdushno-Kosmicheskie Sily) operate 140 Su-24M/M2 frontline bombers and 79 Su-24MR reconnaissance aircraft. The Syiran Air Force has deployed 11 Su-24 combat aircraft. 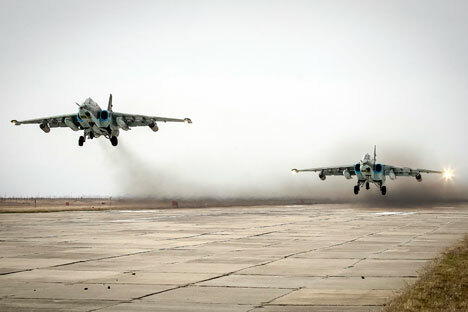 VKS are using Su-24M planes to bomb the Islamic State`s (forbidden in Russia) machinery of war in Syria.